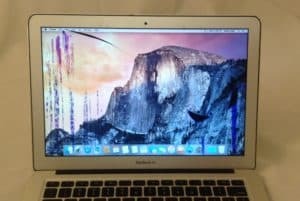 Here’s a great example of a 13 inch MacBook Air (Model A1369) with LCD damage. The screen looks like it’s been stained or drawn on with blue and purple marker, but actually the LCD panel is just broken. You can see part of where it’s cracked diagonally across the top left side of the picture above. This type of damage can happen when the laptop is dropped, stepped on, picked up roughly, or closed on a foreign object–like a pair of headphones. Fortunately, the repair is straightforward–a new LCD panel and one day later all the spots and marks are gone!